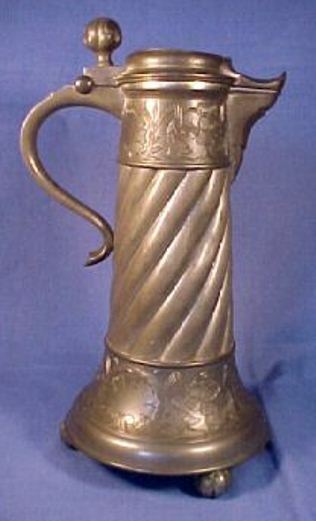 The Master Pewter-smith from Stockholm, Sweden, F. Santesson made this piece. 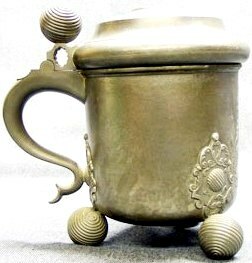 One of the best known, and most respected, producers of pewter steins of all types including the “Daubenkrug” was F. (Frans) Santesson of Stockholm, Sweden. 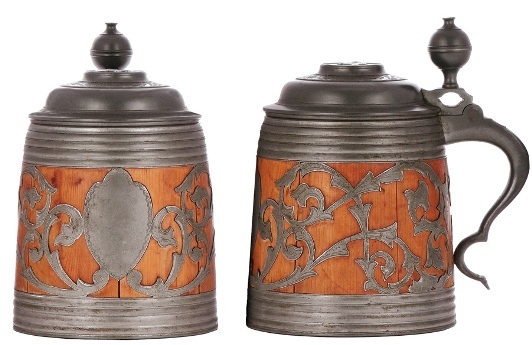 Frans was born into a pewter-smiths family, and learned the trade both by working with his father, and by working for firms in Europe and in the United States. In 1862 he took over his father’s workshop, applied for membership in Stockholm’s Pewter Guild, and after painstaking examination of his work, was accepted. He operated as a pewter-smith in the City of Stockholm until his death in 1916. From Wikipedia, the free encyclopedia: Till Eulenspiegel was an impudent trickster figure originating in Middle Low German folklore. His tales were disseminated in popular printed editions narrating a string of lightly connected episodes that outlined his picaresque career, primarily in Germany, the Low Countries / Denmark and France. He made his main entrance in English-speaking culture late in the nineteenth century as “Owlglass”, but was first mentioned in English literature by Ben Jonson in his comedic play The Alchemist. 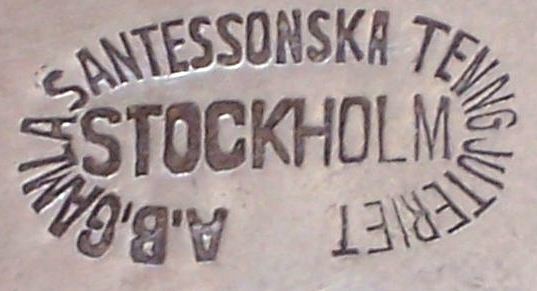 “Till” as represented on an incised H-R stein with a silver plated lid (probably added later as it appears to be for a server. 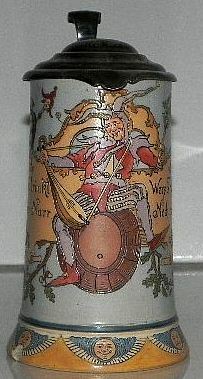 According to the tradition, Eulenspiegel was born in Kneitlingen near Brunswick around 1300. He traveled through the Holy Roman Empire, especially Northern Germany, but also the Low Countries, Bohemia, and Italy. His mobility as a Landfahrer (“vagrant”) personifies the constitution and consciousness of the Late Middle Ages. Since the early 19th century, many German scholars have made attempts to find historical evidence of Till Eulenspiegel’s existence………………While he is unlikely to have been based on an historic person, by the sixteenth century, Eulenspiegel was said to have died in Mölln, near Lübeck, of the Black Death in 1350, according to a gravestone attributed to him there, which was noted by Fynes Moryson in his Itinerary, 1591. “Don’t move this stone, let that be clear – Eulenspiegel’s buried here” is written on the stone in Low German. In the stories, he is presented as a trickster or fool (jester) who played practical jokes on his contemporaries, exposing vices at every turn, greed and folly, hypocrisy and foolishness. As Peter Carels notes, “The fulcrum of his wit in a large number of the tales is his literal interpretation of figurative language.” In these stories, anything that can go wrong in communication, does go wrong. And it is not the exception that communication gives rise to complications; rather, it is the rule. As a model of communication, Till Eulenspiegel is the inherent, unpredictable factor of complication that can throw any communication, whether with oneself or others, into disarray. These irritations, amounting to conflicts, have the potential of effecting mental paradigm changes and increases in the level of consciousness, and in the end, of leading to truth. Although craftsmen are featured as the principal victims of his pranks, neither the nobility nor the pope are exempt from being fooled by him. As “Till Eulenspiegel” was known to frequent both medieval Denmark and Poland, both of which are on the South side of Baltic Sea, with Germany in the middle) these pieces of Santesson’s works which were well made just across “The little pond”, received a lot of attention in the late 1800’s and early 1900’s . 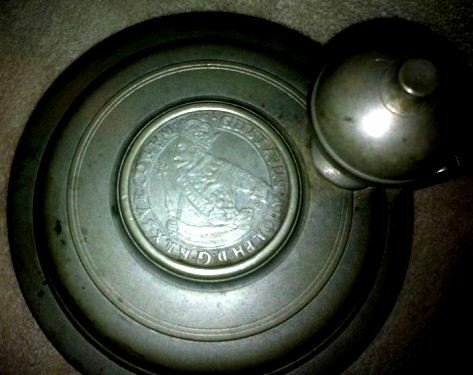 Santesson’s lid medallion (he never used minted coins) on “Till’s stein” is of “Gustavus Adolphus Magnus.” The King of Sweden in an era characterized by almost endless warfare; he led his armies as King from 1611 (at age 17) until his death in battle in 1632 while leading a charge. 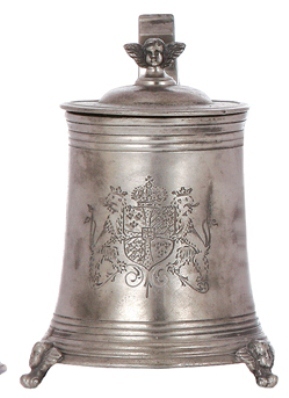 His firm made lots of collectable beer steins with the engraved Royal Coat of Arms of Sweden, and was also known for his Daubenkrug revival which mostly all sold within the Baltic States area and Northern Germany. 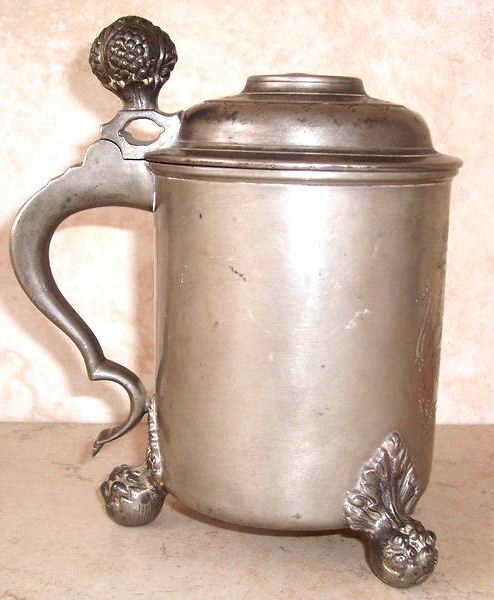 He also had a contract with the USA silver and pewter firm Reed and Barton, in New York to produce some pieces, but with their firm’s name on the steins. Shown: [L] A tall Santesson “Daubenkrug.” Ca.1900. 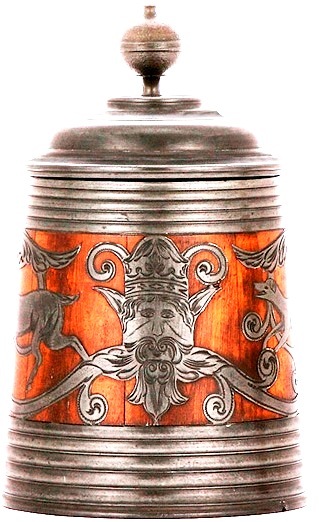 [R] A “roerken” = a smaller Baltic Seas style, all pewter beer stein, with the Swedish National Coat of Arms engraved on it. Sizes of the two pieces shown are about proportional to their actual sizes. 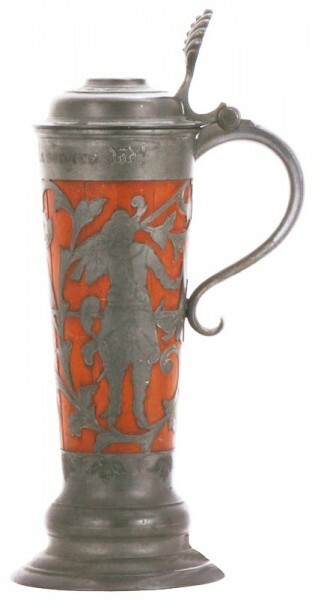 [L] Plain style three legged stein with ‘anfangs’ on the body to which the legs are attached. 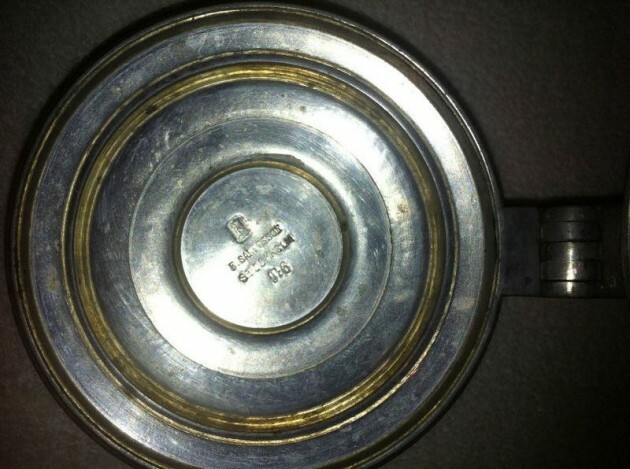 [R] A Santesson (Oval mark – see below) beer server. 11.5 inch. Date letter marks for 1913. Another Santesson Daubenkrug – on this one lid appears to be “mystery finish coated.” This coating which is clear but which over time leaves a different finish from the other parts on Santesson’s pieces has had me puzzled for years ! 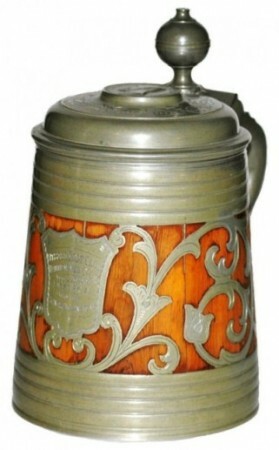 Some steins are completely “mystery finish coated,” While on others, just the lid and the handle were done. It make no sense to me at all. The “Till” stein I own has only the handle coated. I originally thought this to be “Friday’s afternoon’s work,” but that can’t be the case – there is just too much of this coating seen; as the next photo also shows. Anyone with a good idea of why this is, is urged to contact the editor. 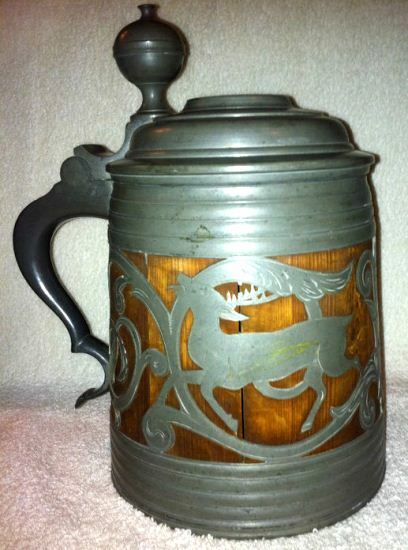 A larger’ two liter’ stein he made for Reed and Barton. This on has no “Arms” engraved on it . Above: Style is from the German, 1500’s. but with Swedish Coat of Arms again. 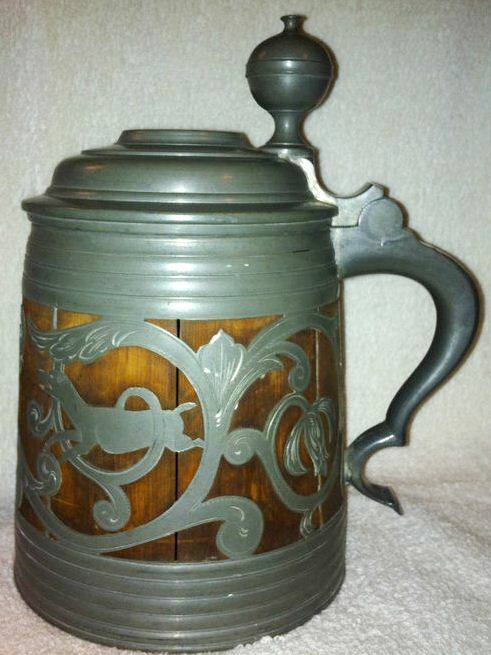 A nicely done Santesson “HVITMETALL” stein. 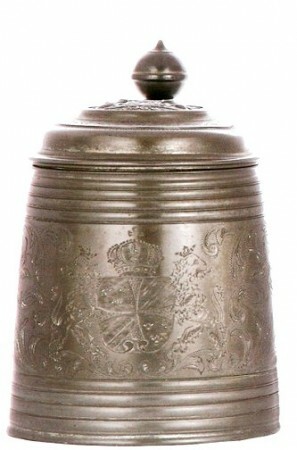 8 inches tall, Date marked “L 6” = 1889. THE READER MUST THEN INTERPOLATE FOR ALL THE YEARS IN BETEEEN.